Smoking American and Soviet-made tanks and planes littering the Sinai Peninsula and Golan Heights in 1973 shocked the world. In only two short weeks, the violence, precision and lethality of the 1973 Arab-Israeli War exposed glaring weaknesses in NATO’s concept to defend Western Europe. Energized by the magnitude of the problem to take on extensive reform, American military leaders embarked on the development of a new concept of how the Army and Air Force could effectively deter, fight and win against a modernized foe in the changed operational environment. In the following years, the U.S. military developed, tested and formalized a coherent, joint solution known as AirLand Battle to counter the Soviet conventional threat in Western Europe. For decades, AirLand Battle and its successors met operational demands and attempts by adversaries to counter its strengths. But today and into the future, ground combat forces confront threats that adapted and modernized their militaries specifically to defeat how the joint force currently fights. Our current and potential adversaries saw the success of AirLand Battle during Operation Desert Storm and have been going to school on us ever since. Their focus is to fracture the paradigms established with AirLand Battle and take away our advantages. With the adoption of AirLand Battle, the joint force depended on overall superiority in domains such as air, maritime, space and cyber as well as qualitative superiority in the land domain to offset vulnerabilities in ground capabilities based on numbers and position. Gen. David G. Perkins, commanding general of the U.S. Army Training and Doctrine Command, speaks at the 2016 LANPAC Symposium and Exposition, hosted by the Association of the U.S. Army’s Institute of Land Warfare. During most of our recent history, the only domain that has been truly contested has been the land domain. The joint force has enjoyed an unprecedented level of freedom of action in the air, space, maritime and cyber domains. This will not be the case in the future. Contemporary and emerging threats seek to gain control of contested spaces not only in the air and on land but at sea, in space and cyberspace as well as the electromagnetic spectrum and the cognitive dimension of human perception. Thus, the increasing number of adversaries who learned to attack the air, maritime, space and cyberspace domain superiority premises of current Army and joint doctrine challenge the U.S. military’s ability to achieve military and political objectives. Domain Battle concept. Multi-Domain Battle is an effort to maintain American military dominance by reimagining joint operations for the 21st century. This concept advances the proven idea of combined arms into the 21st-century operational environment by describing how future ground combat forces working as part of joint, interorganizational and multinational teams will provide commanders the multiple options across all domains that are required to deter and defeat highly capable peer enemies. At its core, Multi-Domain Battle requires flexible and resilient ground formations that project combat power from land into other domains to enable joint force freedom of action, as well as seize positions of relative advantage and control key terrain to consolidate gains. Currently revisionist states seek to alter the post-Cold War security order by coercing neutrals, partners and allies through economic pressure, disinformation, subversion, and the threat of military force. These actions succeed by creating a fait accompli before the joint force can react or by operating under the threshold that triggers a decisive U.S. counteraction. Potential enemies use deception, surprise, and speed of action to achieve their objectives while integrating a combination of economic, political, technological, informational and military means to exploit seams within established U.S. operating methods. Moreover, these adversaries may use, or threaten use of, nuclear weapons and other weapons of mass disruption or destruction to manipulate the risks of escalation. Adversary operational methods take advantage of modernized integrated air defenses and long-range precision strike capabilities to secure a series of limited objectives prior to an effective joint force response. They continue to improve and export integrated air defense systems that provide protection under which ground forces can operate more freely from the persistent effects of joint force standoff targeting and strike capabilities. These integrated air defense networks complicate joint operations because hidden, lethal and dispersed air defenses can allow the enemy to establish superiority in one domain (the air) from a different domain (the ground). Advanced integrated air defenses also protect enemy surface-to-surface missile capabilities, which enable enemy deep strikes without reliance on aircraft. To conduct campaigns, ground forces designed under the assumption of friendly air and maritime supremacy currently require large-signature sustainment facilities and command nodes vulnerable to such missile systems. By extension, adversary missile capabilities also threaten maritime maneuver by placing valuable naval assets at risk. They also can engage large and fixed air bases at increasing ranges, further limiting the ability to project power in the air domain. Operationally and tactically, adversaries limit joint force battlespace awareness by winning the reconnaissance/counter-reconnaissance fight. Their all-domain reconnaissance and counter-reconnaissance capabilities challenge U.S. forces’ ability to shield friendly dispositions and prevent gaining an accurate understanding of the enemy’s dispositions. By coupling developments in reconnaissance such as inexpensive unmanned aerial vehicles (air and cyber domain) with indirect fires assets (land domain), which are now increasingly free from joint force airstrikes and counterfire, enemies can inflict significant damage to friendly forces even when out of direct contact. 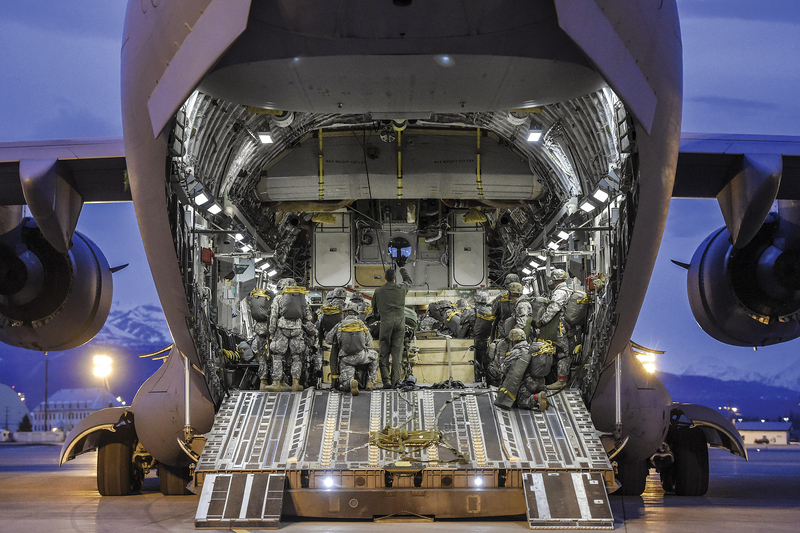 25th Infantry Division paratroopers prepare for a night jump from an Air Force C-17 at Joint Base Elmendorf-Richardson, Alaska. The individual quality of soldiers, sailors, Marines and airmen, combined with training of joint teams and leaders, remains the decisive advantage over modernized threats. To leverage this advantage, Army operations and organizations require a new concept and corresponding capabilities to fully exploit this advantage in the 21st century. Multi-Domain Battle is, therefore, the Army’s concept for applying our advantage in quality of personnel and training through proven combined arms principles adapted to modern technological, military and strategic conditions. Implementing Multi-Domain Battle entails creating and exploiting temporary windows of advantage and restoring capability balance to build flexible, resilient formations in the joint force. AirLand Battle started developing the concept of “extended battlefield.” This concept noted that different commanders had different views of the battlefield in geographical terms. Multi-Domain Battle continues the concept of extended battlefield but now with a focus on the extension across domains and time. The current phasing construct, which is somewhat linear and consecutive, is becoming less and less useful to visualize how conflict is spread across domains and time. There is no longer a singular main battle area but rather, windows of opportunities and vulnerabilities that open and close in each domain. Multi-Domain Battle endeavors to integrate capabilities in such a way that to counteract one, the enemy must become more vulnerable to another. Creating and exploiting temporary windows of advantage require ready ground combat forces capable of projecting power from land into other domains as well as integrating joint and partner capabilities at the lowest level to extend the principle of combined arms maneuver across all domains. However, just as the evolution of AirLand Battle led to the creation of battlefield coordination detachments and air and missile defense commands to coordinate operations in the air and land domains, synchronizing domain windows across five domains in degraded conditions as envisioned in Multi-Domain Battle will require a new generation of innovative Mission Command solutions in doctrine, organization and training across the joint force. A California Army National Guard Chinook supports Marines during high-elevation training in the Sierra Mountains. Army aviators and Navy crew members train at Moses Lake, Wash.
For example, future multifunctional Army fires units will provide the joint task force with a single unit combining surface-to-surface (land and maritime), surface-to-air, electromagnetic, and cyberspace cross-domain fires. These fires formations integrate with emerging Navy, Air Force, Marine and special operations forces capabilities to provide the commander multiple resilient options for striking the enemy and covering joint force maneuver. At the same time, ground forces with improved maneuver and close combat capabilities allow the joint force to overwhelm or infiltrate dispersed enemy formations concealed from joint targeting and fires. A joint force containing effective ground forces requires the enemy to expose their dispersed forces to defeat in ground combat, face destruction from joint fires if they concentrate, or the loss of key terrain if they displace. Future Army and Marine tactical ground maneuver units will combine sufficient cross-domain fires capability to enable decentralized ground maneuver and the creation of durable domain windows for the joint force with the mobility, lethality and protection to close with and destroy enemy ground forces in close combat. With combined arms pushed to the lowest practical level, these units will be flexible and resilient with the ability to operate in degraded conditions and with sufficient endurance to sustain losses and continue operations for extended periods and across wide areas. Chief Warrant Officer 2 Michael Lyons, a Joint Tactical Communications Office communications operator, participates in air-space-cyber training at Nellis Air Force Base, Nev.
Forward-positioned forces capable of executing Multi-Domain Battle can deter enemy actions. They provide commanders with the capability to build partner capacity and are in a position of relative advantage to challenge adversary subversion and fait accompli territory grabs. The battlefields of Crimea, Ukraine and Syria as well as the increasingly contested spaces in Southeast Asia, Northeast Asia and near the Indian Ocean have revealed revisionist states exercising new capabilities that challenge existing joint force strengths. Drawing on time-tested principles of combined arms and the conceptual foundation of AirLand Battle, Multi-Domain Battle is not unprecedented; rather, it proposes to combine capabilities in more innovative ways to overcome the challenges posed by adversaries. Multi-Domain Battle allows U.S. forces to take advantage of existing personnel quality and training strengths to outmaneuver adversaries physically and cognitively, applying combined arms in and across all domains. It provides a flexible means to present multiple dilemmas to an enemy and create temporary windows of localized control to seize, retain and exploit the initiative. Employing Multi-Domain Battle, joint forces with integrated cross-domain capabilities provide a credible capability to deter adversary aggression, deny the enemy freedom of action, ensure joint force access, secure terrain, and consolidate gains for sustainable outcomes. In other words, employing Multi-Domain Battle enables us to win.